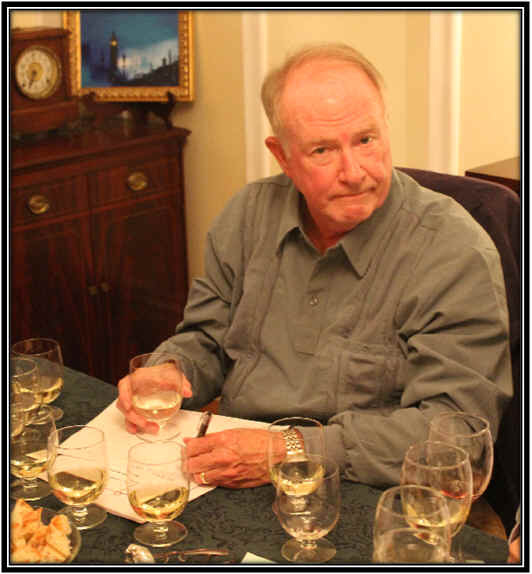 January's host, John McGlothlin had, as usual, a short list of interesting tasting themes. 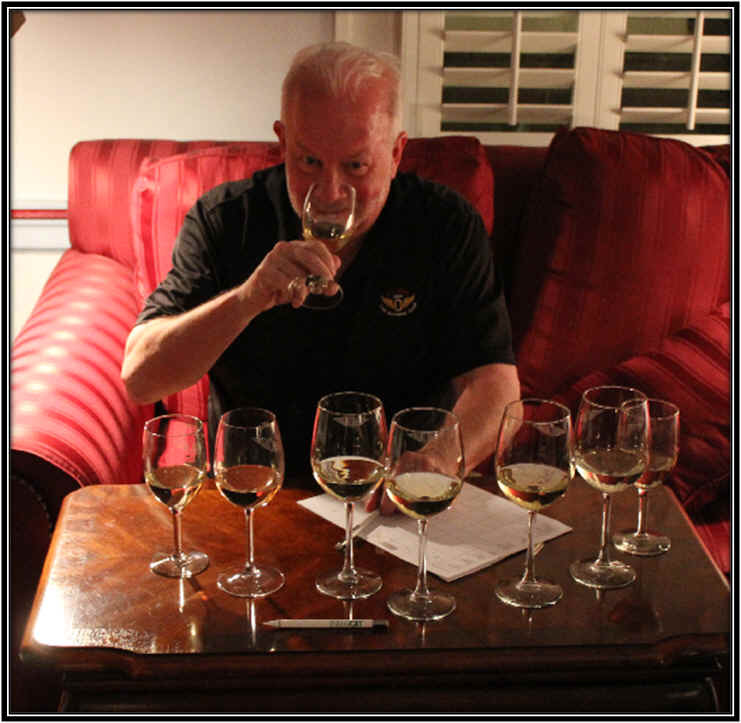 He was curious to evaluate the current state of white wines from France's Bordeaux region, so he assembled a broad spectrum of wines, stretching from $1`1 to $50. 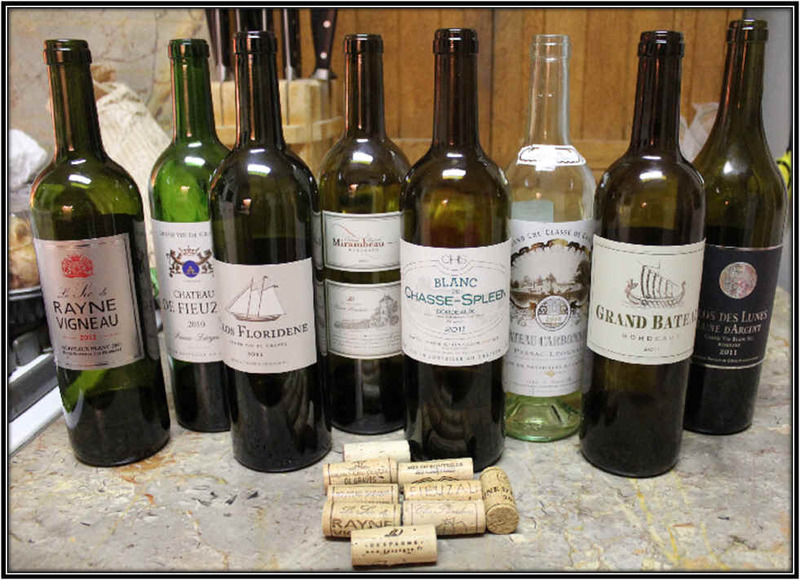 Even better, we tasted wines from estates in various areas: The Medoc is not typically known for white wine production, but a number of wineries are dabbling with vin blanc. 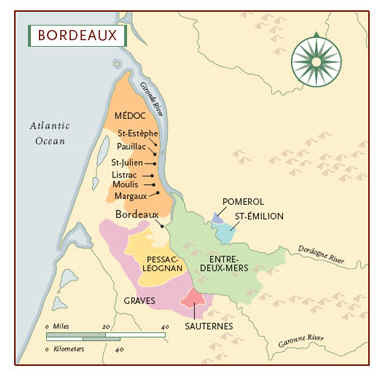 More traditionally, one finds white wines in the Graves and Pessac-L�ognan appellations, as well as in Sauternes (where not everything is sweet). And we had a nice entry from the Entre-Deux-Mers. 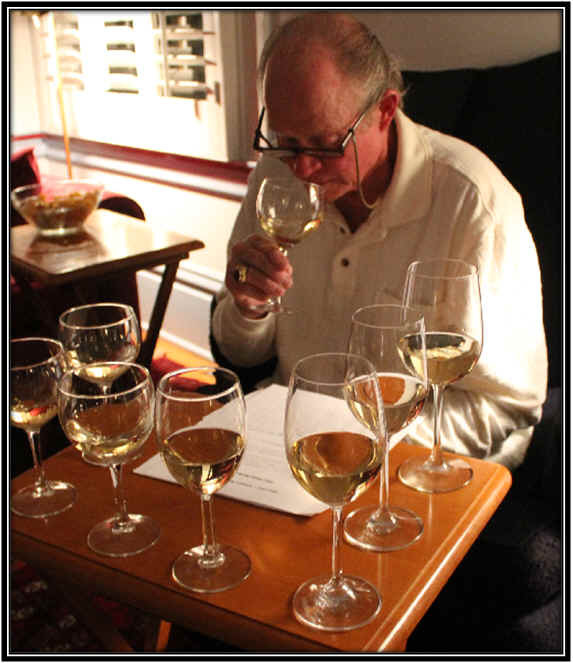 At one time, the Semillon grape dominated the landscape, but over the past few decades, Sauvignon Blanc has become more prominent in making dry white Bordeaux wines. Some producers use solely stainless steel, while other vintners prefer to employ small oak cooperage for both fermentation and maturation of the wines. We had wines from 2010, 2011 and one 2012 bottling. All were reasonably good and the results were remarkably close. 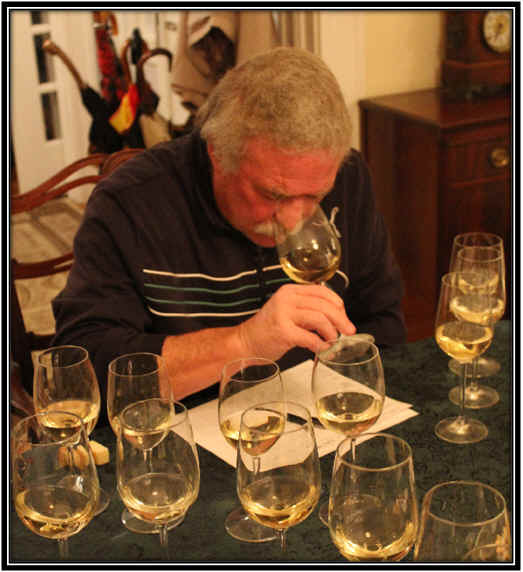 Three wines finished with identical scores at the back of the line, one wine in the middle and four wines were separated by a mean 4 points in the "upper division." This is a new project for the owner of Domaine de Chevalier, a top estate in Pessac-L�ognan. It's an old property in Sauternes and they're making dry and sweet wine there. It was clear in appearance and had a medium-light straw color. The nose was a bit shy and light, with a touch of a hay-like note. It's dry and fairly crisp on the palate, being light to medium-bodied. I found a touch of a fresh peach sort of flavor to this nice little wine...I gave it a one star rating on my three star scale, no stars being a wine of ordinary quality. This wine is made by a negociant firm which also happens to own the Saint Julien estate of Chateau Beychevelle. They are selling this on the coat-tails of Beychevelle. It is clear in appearance and medium straw in color. 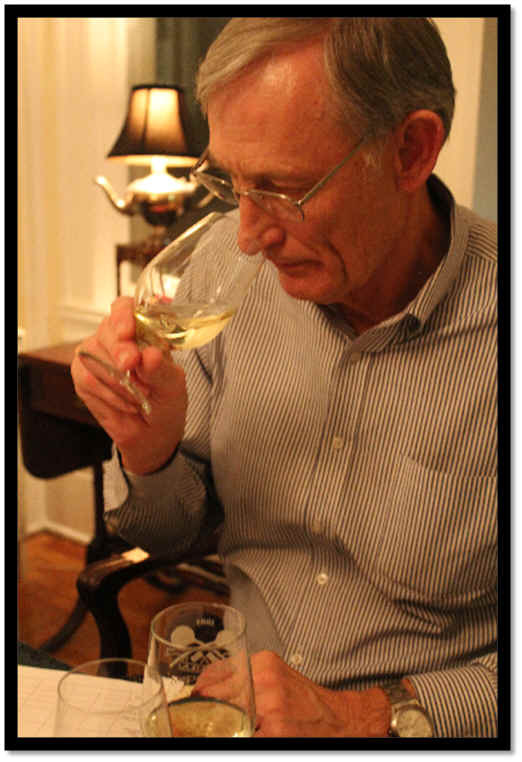 The nose was remarkably pungent, displaying lots of Sauvignon Blanc notes with a hint of a toasty character. It's dry and I felt the acidity was a bit low. Medium-bodied, the wine seemed far more shallow than one might expect given the lovely fragrances wafting from the glass. I still gave it a one star rating and it's a good value. Clear in appearance and medium straw in color, I thought there was an off-note to the nose of this wine. It struck me as having a slightly oxidized quality which I found troublesome. One other taster found it flawed, saying he felt this was "over the hill." The nose also had notes of salt air and a sea-shore sort of fragrance. It's dry on the palate and quite crisp. Tangy on the palate, that salty element is part of the flavor here, with sea shell-like notes. Mind you, we're tasting this totally blind and have no idea which wine is which...I still considered giving this a provisional star for its particular character, even if this bottle did not seem quite right. Oh...they use clear glass and so its flaw may have also been that it's "light stuck." Clear in appearance and medium straw in color, the nose of this wine was quite good and moderately complex. It showed a fragrantly citrusy character and nice lemon notes with a bit of grapefruit and a touch of wood. It's dry on the palate, but I marked this down for it being so soft. 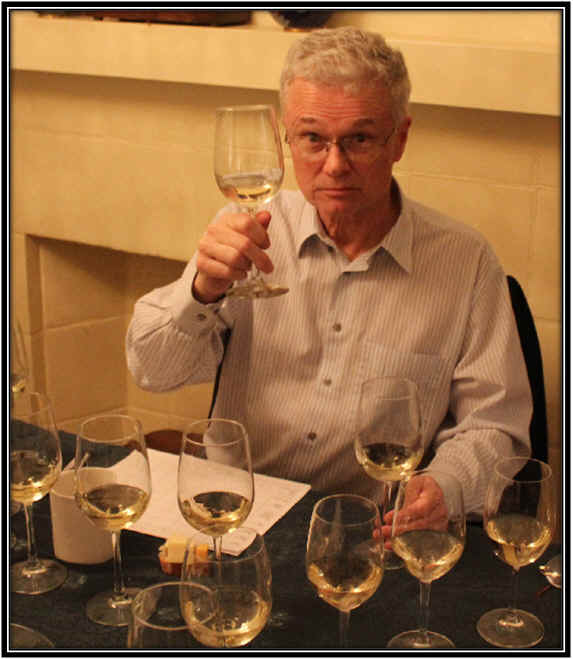 On the other hand, many tasters found that soft texture to be a big "plus," so they were more enthused about this wine than was I. The flavors are quite good, fresh and mildly citrusy with a touch of wood. I was willing to give this something like 3/4s of a one star rating, though. Dry, crisp and tangy on the palate, this is medium+ bodied. I loved the woodsy and toasty notes on the palate which veered off into a spicy, pineapple-like character. Very good! Clear in appearance and light straw in color, this is a dry white from a sweet wine specialist. 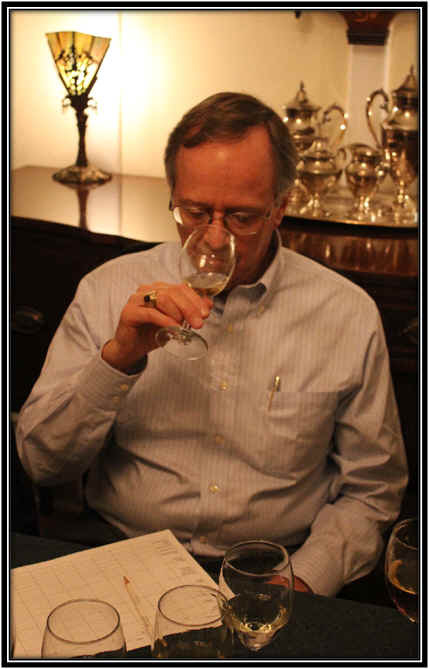 The nose was classically Sauvignon Blanc, with plenty of citrusy notes and a touch of fresh pineapple. Very good fragrances here. It's dry and crisp on the palate, being light in body but nicely intense. Fresh pineapple, again, on the palate, with a lightly peachy quality. Charming all the way around. I gave this one and a half stars, as it's just a shade behind my two top wines. But three tasters found this to be their top choice.